Pope Benedict XVI said: “Raising children can be a difficult task but when we work together with God, it becomes a wonderful task.” The basic education course for parents focuses on this wonderful task and on how to accomplish it with greater joy and sensitivity. The course is based on Fr. Kentenich’s understanding of education and was started by couples, which attended the Kentenich pedagogy course at the Family Pedagogy Academy in Schoenstatt – Memhölz. It has as its driving force a sentence by Fr. Kentenich: “We should be authors of life, authors of life in others.” By working together with God, who is the author of new life, the course focuses on the wonderful task of being co-authors in the development of the most valuable thing that God has entrusted to us: a child. Education of children in the family: this is the greatest desire of the course founders and presenters. 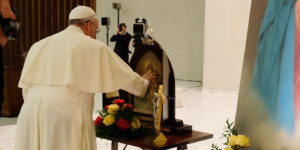 It is also the principal reason for the emergence of this project in 2010 as the International Schoenstatt Family heads towards Jubilee 2014, and falls under the “Marriage and Family” apostolic field and the corresponding virtual tent of covenant culture. The course provides a different way of looking at children and their upbringing; it rejects current society’s view that it is a problem and a burden and focuses instead on the joy that strengthens life in our children, focusing on their growth, development and uniqueness. The course does not see child education purely as a theory or difficulty but rather as a task that complements us. It uses positive experiences and a pedagogy born in the joy of educating people to become free personalities. A team of couples, who are advisors for the Family branches, together with experts in the field, share the fundamental concepts of child education in three different phases: pre-school children, school-age children and teenagers. These modules can be taken independently, or as a set. The principal elements include the transmission of pedagogical concepts based on the age of the child, complemented by examples of education in daily life, sharing as a couple or together with other couples. During this course, a special program was also held for the children, given the course was about them. The course is held at the Schoenstatt centers in Menhölz and Aulendorf – one module per city and once a year. The participating families come from Germany, Austria and Switzerland.